Juicy Couture is one of my favourite fragrance brands, and I own almost all of their fragrances; they’re like Pokémon – you have to catch them all. There’s just something about the Juicy Couture fragrance bottles which makes them so addictive.. they look so pretty within my fragrance collection with their extravagant bottle designs. 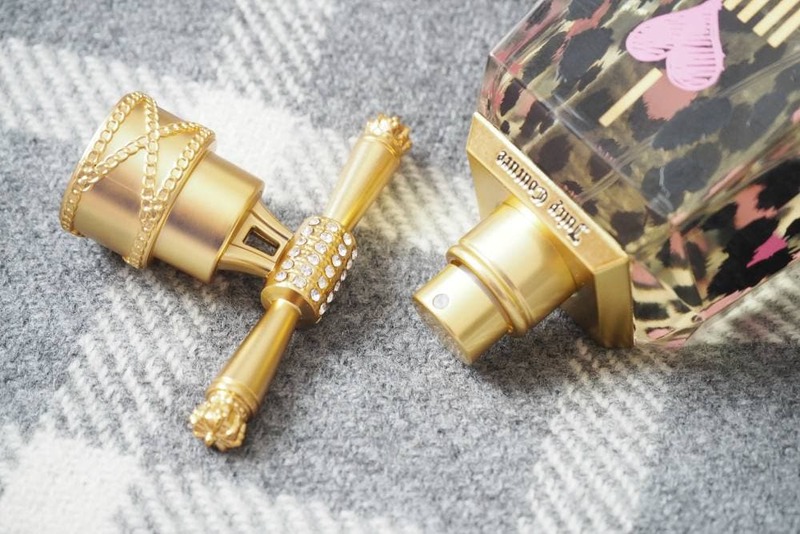 Whenever Juicy Couture release a new fragrance, I’m always excited to try them and I was especially excited to try the new Juicy Couture I Love Juicy Couture Eau de Parfum 100ml as I love the original Juicy Couture I am Juicy Couture. The new Juicy Couture I Love Juicy Couture comes in 30ml £37, 50ml £50 and 100ml £69 size bottles with the following statement; I don’t love lightly. I don’t love half-heartedly. I don’t love passively. I don’t love timidly. I ♥ JUICY COUTURE. The Juicy Couture I Love Juicy Couture’s bottle isn’t going to be to everyone’s tastes but I absolutely love it, and I love that it’s a vamped up version of the original I Love Juicy Couture fragrance, with a faceted clear glass bottle which features a black and pink leopard print design to match the pink heart of the fragrance name, and the lid has the same silver crystals as the original. I know leopard print is controversial, but I’m not even afraid to admit I’m a leopard print fan, obviously it can be very gordy but I think the leopard print bottle suits the fragrance and the Juicy Couture brand perfectly. I have the original I Love Juicy Couture and I think the new Juicy Couture I Love Juicy Couture fragrance is definitely different enough to warrant purchasing the new release; I hate it when fragrance brands release reincarnations of a fragrance which are only marginally different as it’s seems pointless to buy them both. Even though I really like the original, I have to say I much prefer the newer version and I think it’s a lot more unique in comparison. Once first spritzed, the strongest note is definitely the sweetness of the taffy apple but within a couple of minutes the initial fruitiness does soften slightly to develop into a fruity floral and I think this might be my favourite Juicy Couture scent so far which is a pretty bold statement seeing as I own eight different Juicy Couture fragrances. 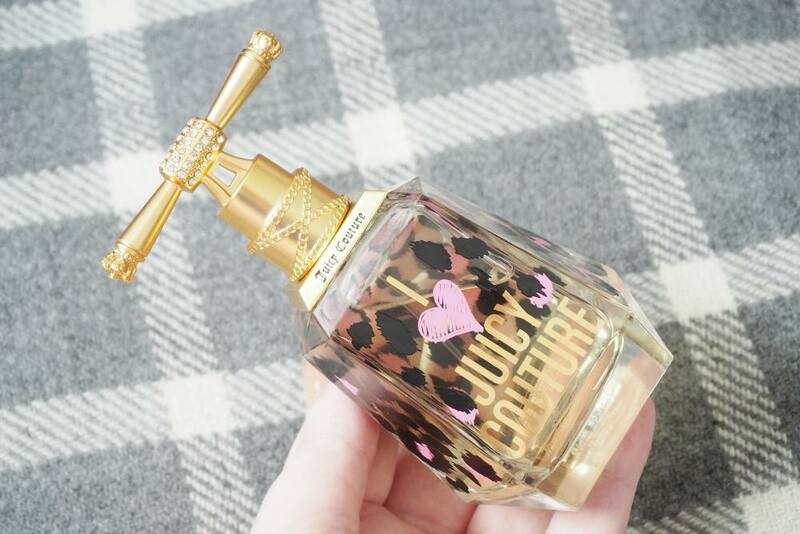 I find all of the Juicy Couture fragrances to be quite sweet which I think is why I love them as I always favour sweeter scents, but I think I Love Juicy Couture isn’t overwhelmingly sweet like some of the others. It’s definitely still a sweet fragrance, but I feel that it’s a sweet floral rather than just being fruity sweet. I am also very impressed with the longevity of the new I Love Juicy Couture as it lasts for around six hours on my skin which is the longest a JC fragrance has lasted on me and it’s currently summer and I always find that fragrances dissipate quicker than they do during the cooler months. I really do recommend giving Juicy Couture I Love Juicy Couture a spritz next time you’re near a fragrance counter even if you’re not normally a fan of their fragrances, as I think it’s a really gorgeous fragrance and one that’d be difficult not to love if you favour sweet or floral notes. I’d love to know what your favourite Juicy Couture fragrance is?